play through the bible – a review and a GIVEAWAY!!! Perhaps, I thought, my friend would do a PhD and teach academically, or take on a teaching position within a church or Christian organisation. However, her calling was to be greater than that: Alice Buckley has written a book which unlocks the Bible not for lofty academics, but for preschoolers – and I genuinely believe that it has a thousand times more potential for changing lives than any of the weak-by-comparison suggestions my mind played through. Why start teaching the Bible at 18 when you can teach it from birth? ‘Play through the Bible’ works like this: There are 20 stories from Luke’s gospel. Alice suggests that you take one story per week, the daily repetition helping kids to remember it. 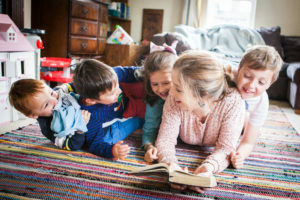 She has expertly rewritten each story with language simple enough for a very small child to understand, as well as plenty of opportunities for them to join in – and, of course, there are numerous suggestions for actions, signs and voices you may like to use, as well as props (all of which can be found around the home). The suggestion is that families find a few minutes each day in which to tell this story – perhaps over a meal (we do ours over breakfast). However, anyone who’s even been within five miles of a preschool family knows that there will be a plethora of reasons why this might not always happen – but Alice is so grace-filled in her approach “Let’s agree not to guilt-trip when we miss a day (or week, or month! )…Deal?” she offers, reassuringly. Missy trying to ‘fix’ a ripped sheet of paper. Jesus can fix us when we’re poorly! And then, the genius: every story comes with multiple play ideas related to the theme. Again, Alice is realistic, suggesting families concentrate on just one or two things. As a mum of three young children, she knows what fits easily into our lives, and recognises that each child learns differently. There are ideas for craft and cooking, things to spot or do when in the park or walking down the street, active games to play in the home and outdoors, and ideas for bringing Jesus naturally into the conversation. In week one, when we heard about Jesus being God’s son, we used Alice’s idea of making a scrapbook to illustrate the point. Missy had been given one for her birthday, and loved filling it with pictures of her favourite Disney characters and other random colouring pages! Once made, it became an integral prequel to our telling of the Bible story: we would go through the book asking: “Is this my daughter?” with the kids responding “NO!” until we reached a photo of Missy at the very end – “YES!”. In the same way: “Is John the Baptist God’s son?”, “Is Jesus God’s son?” – you get the idea! Week 2 was about Jesus being tempted in the desert, and how he listened to God, not the devil. My children’s favourite activity from the selection was playing ‘Simon Says’, which we played at the breakfast table each morning with no props or preparation – and yet it clearly brought home the point about listening! Jesus’ healing miracles – poorly toys! Last week, we looked at Jesus’ healing miracles. As luck would have it, I took my kids for their flu vaccinations last week: it was a great opportunity to reinforce the story through talking about how Jesus heals – that he heals through medicine, but also that he can heal just by touching people, without any need for medicine. It wasn’t a long, deep conversation – it wasn’t onerous, and it wasn’t hard to remember to do – it was very natural, because we’d been thinking about healing all week. This week, we’re onto Jesus and the fishermen – and Mister is already looking forward to a fish-and-chips dinner later on this week! This week’s story…complete with sieve/’net’ and cardboard fish! The suggested age range for this book is 2-7, but we’ve been using Alice’s ideas (from her excellent blog) since Mister was 2 and Missy was a baby. Who knows what Missy was taking in, but it certainly wasn’t harming her to start hearing God’s word played out in a fun way! The very first time I saw Missy respond to God’s word was when she was around 16 months. She had very few words, and a handful of signs – but when, sometime shortly after Christmas, I mentioned the name ‘Jesus’, she signed ‘baby’. A small gesture, but a miraculous one: Missy was demonstrating that she’d taken in something from the Christmas story – Jesus being born as a baby! There really isn’t a start age for teaching God’s word. The problem is that most ‘preschool’ resources up until now have focused primarily on the 3-5 age group, i.e. children with some amount of verbal communication. Play through the Bible is unique in reaching children with God’s word before they can verbally communicate. I knew this book would be incredible, because Alice’s ideas have been tried and tested in our family over the last three years. What I didn’t know was how beautiful the book would end up looking. It’s fab! Bright and colourful, with lovely illustrations and photos. Whilst the words are aimed at grown-ups, the book is enticing enough to have open on the breakfast table. My kids love looking at the pictures and trying to guess all the ideas we may (or may not!) get round to doing in the week! This book has the power not just to change children’s lives, but the attitude of us parents, as we step up to the responsibility God has given us for teaching our children His ways. It’s not only a great resource in itself, it opens up a dialogue about how we can teach our children about the God who loves them. Think what priceless treasures we’re passing on to our kids if we’re able to teach them God’s word right from the start of their lives! If you don’t believe me, why not check out SparklePetal’s review here? And, while you’re at it, you can view Alice’s promo video for the book here! Now – who would like a free copy? Type a comment below and I’ll put all the names into a suitable receptacle on Sunday evening (Nov 9th) – the winner will receive a copy in the post at some point next week. Even if you don’t have young children – why not enter anyway? I’m sure any family you know would be totally blessed by this surprise gift! I’ll announce the winner on Facebook (as well as letting them know personally). Disclaimer: No payment has been received for this review, even though it’s ridiculously positive, and reads like there’s been some secret commission exchanging hands. I did not receive a free copy to review – Christian book companies do not have money to burn – although perhaps if enough of you order the book, Alice may buy me a drink if we ever meet again. Sounds great! Please enter me in the prize draw! I’m sold! We’d absolutely love a copy and I promise to wave it around at the other mums at church! I was already sold on e book but your review has made it top on my wish list!!!! This book looks brilliant! My daughter would love it! This sounds great. Where can we order from if we don’t win? Oh yes, I definitely recommend Alice’s ideas for under 3s groups at church! With her permission, we adapted her ideas and used them for our under 3s at our previous church, and they were great, so much more effective than reading from a children’s bible, which that age group really doesn’t have the attention span for (at least not en masse!). However, the beauty of this book is that it’s designed for home use, to work around family life, to help kids to engage with the Bible not just on a Sunday, but every day of their lives. It’s powerful stuff! Sounds brilliant, can’t wait to own it! This sounds amazing, I’d love a copy. Sounds brilliant, would love to share it with families at church! We have the bake through the Bible and this looks just as fab. With three children aged 4, 2 and 11 weeks I’m up for anything that will help them engage more with God’s word. Oh, wow, you have my respect! Alice is definitely your woman then 🙂 At one point, if my Maths is correct, she had a 4yo (with additional needs), 3yo and a baby. What I perhaps didn’t make clear in the review was just how simple Alice has made it for us – the ideas don’t require hours of prep. In fact, this week, I prepped ours on Monday morning as we were having breakfast, then told the story straight away…oops! But it worked fine! My kids would love that, thanks for the review! Would love this! Please count us in for the draw! yes please! this would be great for our new playgroup leaders! Sounds like an amazing addition to any family- I’d love a copy! This sounds perfect for our Tots’ Praise group. We choose some songs and finger rhymes around a theme then we read or act out a bible story and finish with a simple activity, over coffee and chat. It would really help with planning. Oh yes definitely! We used Alice’s ideas (adapted) for our toddler group, and they were a big success. Your group sounds ace! There’s a distinct difference with this book as opposed to other ‘similar’ resources, in that this is written specifically with the family in mind, not a church group – the way it’s structured assumes you have daily contact with each other, that you can play/chat through a story all week – but, that said, I know from experience that many of the ideas work really well in a group too. Wow. This looks so good. If I don’t win one, I may have to pop it on my 3 year old’s Christmas list! 😉 Thanks for letting us all know about it. All the more reason to get a couple of copies then 😉 All the best for the draw, maybe you’ll win one of them! Hi, I would love this book, thank you for the opportunity! It looks really good! Very excited about getting this book for us and for our friends too. Bake through the bible has been a big hit already! Sounds fantastic. Thanks for the review. My friend wrote Bake through the Bible so I’d be very interested in this book. The book sounds great! Thanks for your review. Love the blog! Please enter me in the prize draw. Sounds great for family devotions, count me in. Also sounds like some good ideas as a starting point for an after school group I’m setting up for 5-7s. Sounds great! Please enter me. I had already put this book on my Christmas list as the title was so inviting, a free copy would be amazing, but after reading this review I’ll definitely be making it a very high priority to get!! Thank you! wow! What a fantastic book. This is what I’ve been looking for. If I don’t win it, I will certainly go out and buy it! And as gifts for friends too. Awesome. sounds like an amazing resource. This looks fab! I’m ordering a couple of copies for presents and would love to enter the free draw for a copy for us! I would really love to be considered for this book . I’m always looking for new ways to share Jesus with our children and the crèche we run. This book sounds great! Possibly good for church groups, toddler groups too? If I don’t win a copy I may just add it to my, or my kids Christmas list. One for the grandchildren – a definite for the Christmas present list. Brilliant post! already got a copy so don’t need to be in the draw. Wish I’d had this book when mine were little. It is brilliant. An buying a copy for an adoption baby shower present!